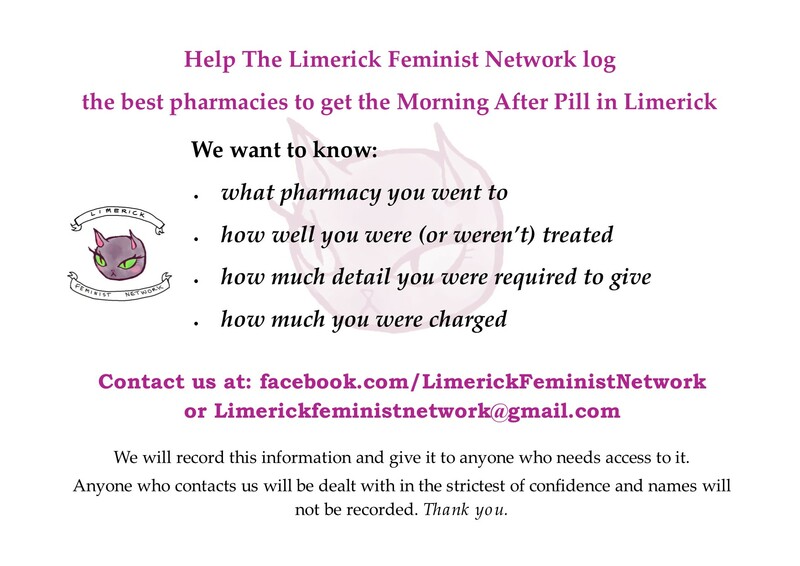 We have asked the public to get in touch with us and share their experiences getting access to the morning after pill in Limerick. Our aim with this campaign is to empower people with knowledge, help erase the stigma around getting the morning after pill and make it as easy as possible for people to get the morning after pill by giving information about local pharmacies in terms of treatment, privacy and cost. The table below includes all of the information we have received so far, pharmacies are presented alphabetically. If you have information or a story you would like to share please scroll to the bottom of this page for information on what we need and how to get in touch. Thank you to everyone who got in contact with us so far. Pharmacy Address Was MAP available? Pharmacist male or female? Privacy? Treatment? Cost Was the consultation overly invasive? *Disclaimer – this is information was given to us voluntarily from members of the public. In some cases we have been given conflicting reports of pharmacies and the treatment people received, this is due to the individual pharmacists and not the particular pharmacy. We have included all of the information we received to try and best inform anyone who needs access to the morning after pill. Unfortunately, we must note that while we cannot guarantee everyone will have a positive experience in these pharmacies we hope this information will make the whole process easier for people. For information on where you can best access the morning after pill outside of Limerick check out Re(al)-Productive Health. Re(al)-Productive Health promote full, accessible and unapologetic reproductive health and well being for people in Ireland. You can find there website here. Re(al) Productive Health are petitioning The Pharmaceutical Society of Ireland in the hopes of ending the conscientious objection to emergency contraception in Ireland. Currently in Ireland, pharmacists may refuse to provide you with emergency contraception (the ‘morning after pill’) under a ‘conscientious objection’ clause. This, of course, can cause major access issues and increases the stigma surrounding reproductive health in Ireland. Please sign this petition if you believe the personal beliefs of an individual should not impact upon the reproductive rights of others. 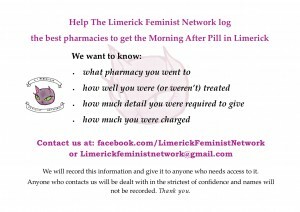 The Limerick Feminist Network wants to start a log of the best pharmacies to get the morning after pill in the Limerick area. We would really appreciate it if the public could let us know about their experiences (good and bad) getting access to the morning after pill. We would like to know: what pharmacy you went to, how well you were (or weren’t) treated, if the questions you were asked were overly invasive, and how much you were charged. We will record this information, share it on our website and give it to anyone who contacts us that needs access to the morning after pill. Anyone who does contact us will be dealt with in the strictest of confidence and names will not be recorded. You can contact us via facebook.com/LimerickFeministNetwork, twitter: @LmkFeminist or at Limerickfeministnetwork@gmail.com. Please spread the word. Thank you.